LISTING YOUR HOME FOR SALE IS A BIG STEP AND YOU WANT TO BE SURE THAT THE REAL ESTATE COMPANY YOU USE WILL GIVE YOUR HOME THE BEST MARKETING ADVANTAGE. Staging - We offer a free staging service which includes accessorizing your home for greater buyer appeal. Virtual Tour - We produce a virtual tour of your property - interior and exterior- at no cost to you. The tour is added to your listing and also to dozens of other web sites. A weekly report is sent to you showing how many potential buyers viewed your tour. Open Houses - We hold an open house at your property two times a month. 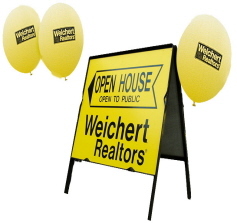 The display signs and balloons we use, attract more visitors to your home. We send out special invitations to the neighboring area. People in your area are most likely going to know someone looking to move close to them. Qualified Buyers - We make sure that the potential buyer is qualified before showing your property so we don't waste your time. Internet Marketing - The Weichert web site is the "stickiest" web site in the business according to statistical information. This means people stay on the site longer and view more properties. Additionally, we feature new listings on Homes.com, a major consumer web site, which means your property appears at the top of the page when anyone views the area. Specialized Marketing - Through our network of affiliated Brokers throughout the United States, we can market properties having special features such as waterfront Florida homes, homes with extensive acreage, estate properties, or Florida beachfront properties for sale. IF YOU WOULD LIKE A COMPLIMENTARY HOME VALUATION, PLEASE COMPLETE THE FORM BELOW AND INCLUDE YOUR NAME, ADDRESS AND E-MAIL. WE WILL PROMPTLY SEND YOU THE INFORMATION.